Sometimes a miniature doesn't need some elaborate conversion, or crazy OSL or NMM effects to make it stand out as being spectacular. This Ogre is great for it's perceived subtlety. It looks like it could be a stock model, but is in fact, heavily converted and kit bashed. 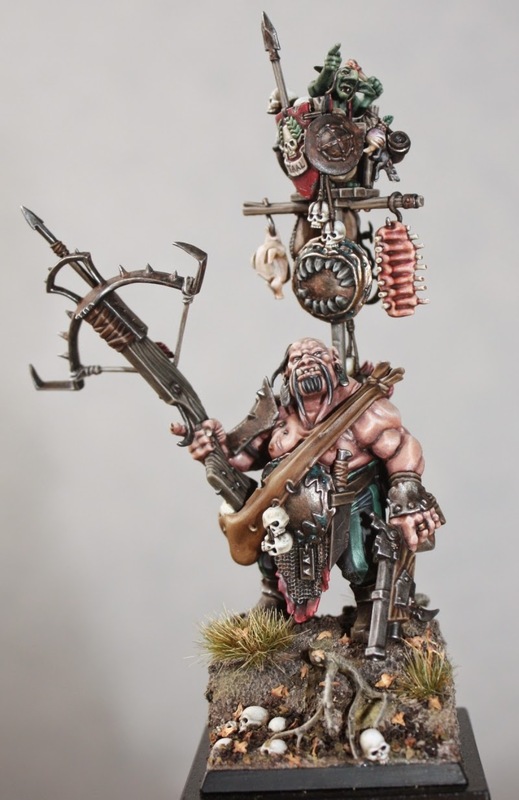 The hobbyist has just tried his hardest to make it fit in with the Ogre aesthetic and army theme. This, to me, is sometimes more impressive then the crazy over the top conversions you see out there. This requires you to match your style to an already established style, which isn't as easy as you would think. There is a real sense of personality on display with this guy too. He definitely comes across as a hunter as the title of the piece suggests. One of my favorite touches is actually on the base. I really love the tree root coming out of the earth and intertwining with the skulls. Skulls are such an iconic part of the Warhammer universes, whether you like them or not, and it's always nice to see them incorporated into a model in a way like this. It's not a pillar or field of skulls or anything, just a little pile of them amongst some leaves and dirt. Perfectly understated. The paint job on this guy is a true 'Eavy Metal style job. It's smooth, crisp, colorful, and just has the GW vibe to it. It's one of my favorite painting styles for miniatures. It seems like the current trend is to be as dark, gothic, and realistic as you can, which is great too, don't get me wrong. After seeing SO many minis like that though, it's refreshing to see some in this more traditional Warhammer painting style. 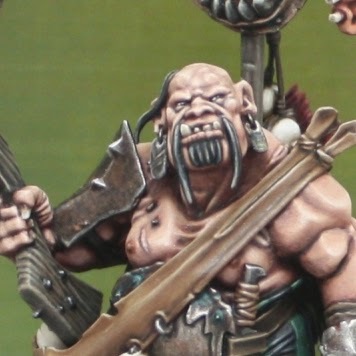 I feel like if he were places with the studio's Ogre army he would stand out as being a higher level of painting, but at the same time, fit in perfectly. What can I say, I love me some 'Eavy Metalesque painting.